“Here, take one of these milkweed balls. We’re going to throw them in the ditches along the road. Please help us save the monarchs!” We were a few days into RAGBRAI, the annual mega-group bike ride across Iowa, and I hadn’t heard the instructions that were given at the previous stop. “What is this? !” I asked Pastor Chad Jennings, one of my riding companions. Touch the earth lightly, use the earth gently, nourish the life of the world in our care. Gift of great wonder, ours to surrender, trust for the children tomorrow will bear. Butterflies are among my favorite creatures. In seventh grade, I bought a butterfly net and started my own butterfly collection. I kept the collection for forty years before deciding it was time to let it go. I love to watch butterflies flying freely, especially the colorful and beautiful monarch, perhaps the most recognizable and popular of all butterflies. They remind me that I would probably be healthier if I, too, were more carefree like a butterfly and less wrapped up with work. What I didn’t realize when moving to Iowa a year ago is that the monarch butterfly population in Iowa had declined by 90% within the past two decades. The reason? The disappearance of the milkweed plant. Monarch butterfly caterpillars need milkweed in order to survive. 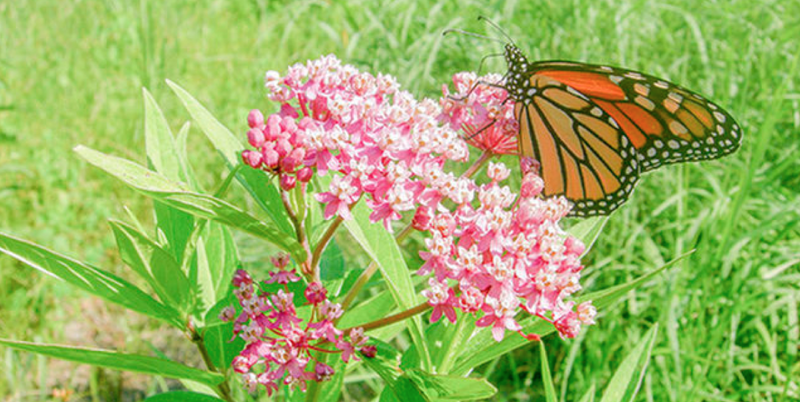 Milkweed is the only plant upon which butterflies lay their eggs, and it’s the only plant they eat. In less than two weeks, the caterpillars grow to 2,000 times their original mass. It’s September, which is the time of the great monarch butterfly migration. Have you heard of it? In the fall, millions of monarchs that are born east of the Rockies migrate three thousand miles from Canada through Iowa and the Midwest to Mexico, where they spend the winter in the Sierra Madre Mountains. It’s one of the most amazing wonders of nature. Monarchs can travel at altitudes of up to 10,000 feet and are the only butterfly species to make a two-way migration of this length every year. They only travel when it is light and normally cover between fifty and a hundred miles a day. Did you know that the monarch migration includes several generations? No one butterfly makes it the entire way. Offspring return to the same winter destination and even to the same trees used by previous generations. Unfortunately, in 2013 the monarch count in Iowa was lower than it had ever been since recording began, so conservationists became involved. In 2015, fewer than fifty million butterflies made it to Mexico when the number was once one billion migrating monarchs. Contributing factors are illegal deforestation in Mexico and severe weather along the route. However, most devastating to the monarch has been the virtual elimination of the milkweed plant in the Midwest by the introduction of a very powerful herbicide. For decades, milkweed has grown amidst Iowa row crops, which make up two-thirds of the land. When Monsanto introduced their Roundup Ready Technology, where corn and soybeans were genetically modified to withstand the herbicide glycosate, the milkweed that is so necessary for monarchs to survive, was killed. Targeted herbicides, edge-to-edge planting, and development have all resulted in the loss of milkweed, preventing monarchs from laying eggs, and thus disrupting the annual monarch migration. We who endanger, who create hunger, agents of death for all creatures that live. We who would foster clouds of disaster, God of our planet, forestall and forgive! Milkweed may be a weed to corn and soybeans, but it is life for a monarch butterfly. Because Iowa is at the center of the migration, milkweed is critical for maintaining the health of monarchs. Not only do monarchs lay eggs on the milkweed, and not only do caterpillars eat the plant, but adult butterflies also feed on the nectar from milkweed. In 2014, The University of Iowa College of Public Health decided to make two thousand milkweed seed balls with the help of volunteers and Girl Scouts. The “little balls of grace” are made up of milkweed seeds inside of a mixture of soil, clay, and compost. At twelve UI research farms, nine milkweed species were grown in order to determine their effectiveness in expanding the monarch population in Iowa. The most effective seem to be the common milkweed and swamp milkweed. Research is also being done into how and where milkweed and other butterfly-friendly plants can most effectively be reintroduced along the monarchs’ main summer breeding and migration routes between Minnesota and Mexico, including I-35 in Iowa. Let there be greening, birth from the burning, water that blesses and air that is sweet. Health in God’s garden, hope in God’s children, regeneration that peace will complete. For the last several years, RAGBRAI cyclists have been asked to take milkweed seed balls and throw them into ditches and fields in the midst of their own cycling migration across the state. What a beautiful way to protect our beautiful monarch friends on their migratory journey back and forth across the continent! It’s just like handing everyone a ball of grace to spread near and far. The plight of the monarch butterfly reminds me once again of how interconnected we are on this one fragile planet that we call earth. In the midst of disasters of huge proportions, such as wildfires, hurricanes, mudslides, and earthquakes, which cause monumental damage, our population of monarch butterflies has declined precipitously. In this web of nature, each one of us, including you and me, bears responsibility for treading lightly upon the earth, for God has given us this one planet to share and care for. As I look at my seed ball, I wonder. How can you and I be little balls of grace for our world this week? God of all living, God of all loving, God of the seedling, the snow, and the sun. Touch us, deflect us, Christ, reconstruct us, using us gently and making us one.